Shouldn't joke really, it is probably not a good time to be in Chile, but the tsunami is unlikely to amount to much by the time it gets here in an hour or so (it's raining and cold here, I'm not going to the beach to look). Coincidentally, we applied for jobs in Concepcion, right where the epicentre was, many years ago. Sent off the applications, heard nothing back, until a full year later when they asked if we were still interested! We didn't pursue it further though - I think by then we might have got our current jobs in Japan. Didn't expect this would save us from a major earthquake though! [jules' pics] Save the Banker, save the world. pork belly futures, originally uploaded by julesberry2001. 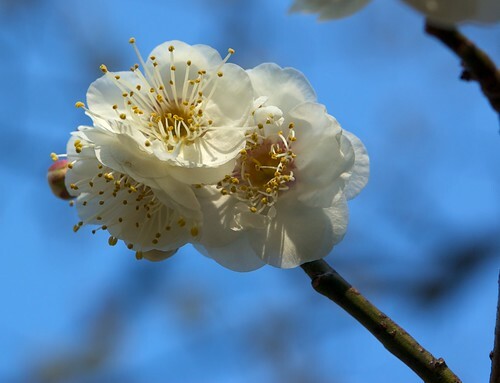 plum blossom (ume), originally uploaded by julesberry2001. 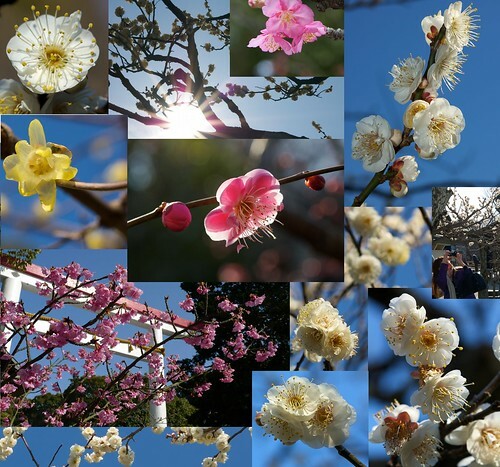 Oh no, more plum blossom! 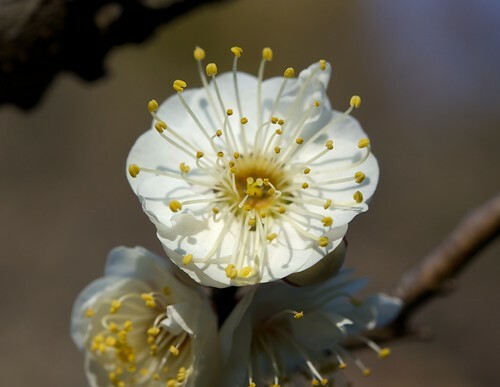 Hmmm, how to describe the plum blossom addiction... well - while cherry blossom is municipally planted in obvious and sometimes rather ugly places, plum blossom is more hidden. One scores one point for each tree one spots first. Off to Tsukuba and Tokyo tomorrow - with any luck there will be tales to tell as a result. They found that sea surface temperature data alone were not enough to make accurate predictions, but that assimilating monthly average subsurface temperature and salinity data significantly improved the accuracy of forecasts. Well, I suppose that doesn't sound so exciting really. However, it is making a significant point. This is based on the work I mentioned last year, when the first author visited Japan for a workshop. They have done a bunch of experiments to show that assimilating surface data generates a physically unreasonable response in the ocean circulation, whereas assimilating subsurface data as well produces a much better result. Of course, Keenlyside et al only (who are copiously referenced in this paper) used only surface data, and were taken to task by it on RC (1, 2). Ouch. Of course, with a different model and slightly different technical details, it is not impossible that K's method is useful. But they aren't prepared to bet on it, and neither am I! Sugita, Yokohama, originally uploaded by julesberry2001. Number 2 in the series, "the toxic waste part of town where we work". 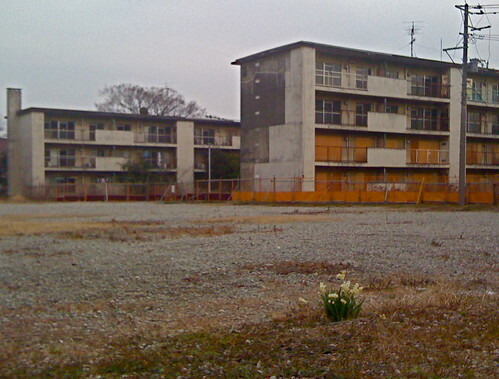 The concrete will crumble and nature will win in the end. Go daffodils! 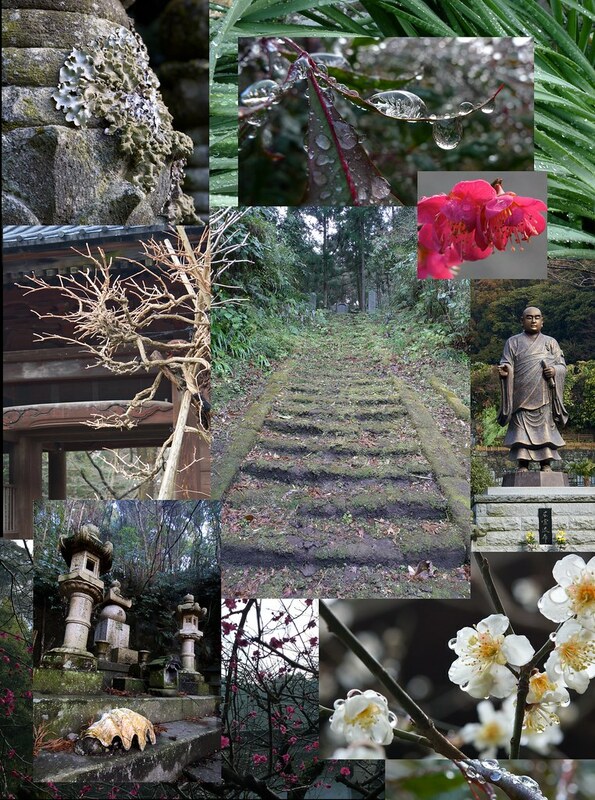 I have been struggling with how to describe Myohonji, a temple not often visited by casual tourists to Kamakura. As I remarked in an earlier post it is full of contrasts. 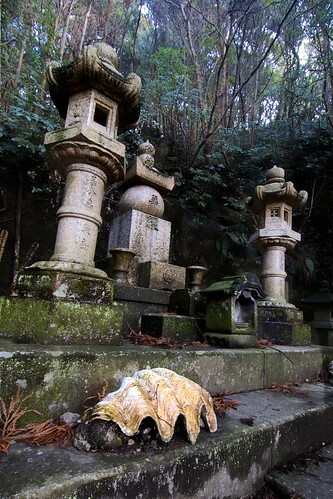 It also contains a lot of weird things like the the giant clam shells, a disappearing staircase, tombstones growing lichen and a giant shiny new statue of Nichiren, making it like a level from tomb raider perhaps, or something from Indiana Jones. Nichiren, is an amazing guy who founded at least 8 of the top 5 temples in Kamakura as well as thousands of other temples all over Japan. As it is quite new, the statue is best viewed on a cloudy day; it is rather dazzling in the more usual bright sunshine. gorinto and shell, Myohonji, Kamakura, originally uploaded by julesberry2001. According to Wikipedia "On the black market, giant clam shells are sold as decorative accouterments, and the meat, called Himejako in Japan, is prized as a delicacy". ...which really doesn't do much to explain the decoration at this rather large dark and dank Mausoleum (is that the right word? Everyone is cremated in Japan and I'm not sure what you call the area - can one still say tomb? The central 5 piece structure is the spiritually significant "gorinto"). snow, originally uploaded by julesberry2001. 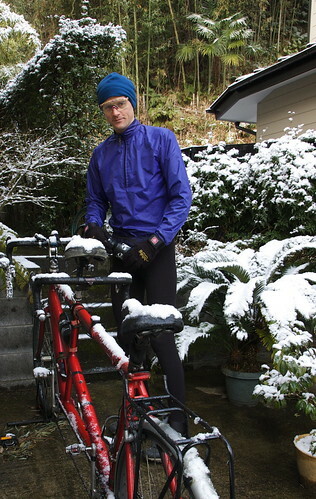 Ready for a nice ride to work? Yes, that's my seat all covered in snow! Plum blossom (ume), Myohonji, originally uploaded by julesberry2001. But before we freeze completely, I had better take it all back. The UK is lovely bright warm and sunny. Try turning up the saturation on your camera and your pics will look colourful too! 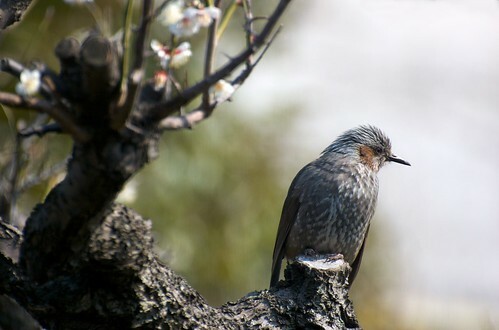 Brown eared Bulbul [hiyodori (ヒヨドリ)], originally uploaded by julesberry2001. Shooting birds is so much harder than some make it look. Acheivements Sunday afternoon = nil. It seems that Tim did pretty well in his debate with Monckton in Sydney. The whole thing isn't on video (yet? Unless anyone knows differently) but the final summing up is worth watching. I thought that using the Last Glacial Maximum was a great choice for indicating to a non-specialist audience how sensitive the climate is to forcing changes, then I looked at his slides (see here) and saw he cited us for the calculation :-) The figures are taken from the literature and the calculation is standard, and while there is room for debate over exactly how accurately the ~3C result can be interpreted, it is hard to justify a figure which is too far either side. Probably the highlight of Tim's talk was to get quotes from someone saying that Monckton had misinterpreted their work and the IPCC had not, though. 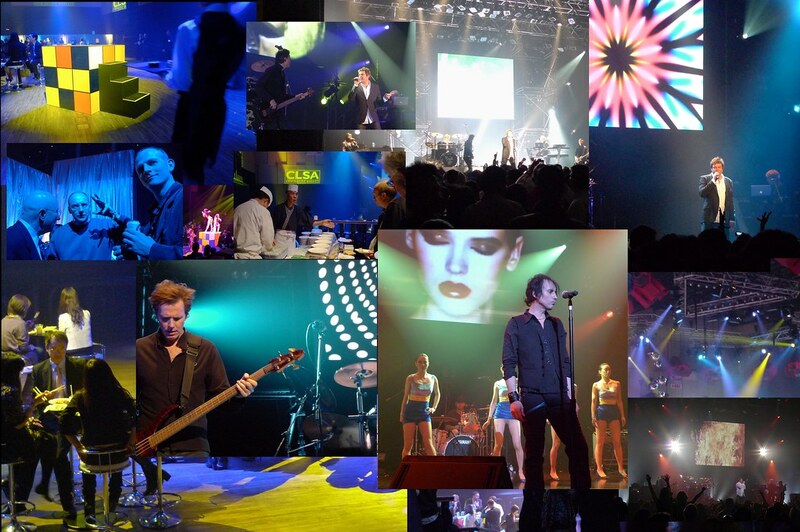 If anyone doesn't read Tim's blog, it is well worth a look, though I don't often (ever?) wade into the debate there. His experience of dealing with credulous contrarians on many subjects probably puts him is a better position than most climate scientists, so I hope he makes a habit of taking on such debates. Wolfie, originally uploaded by julesberry2001. 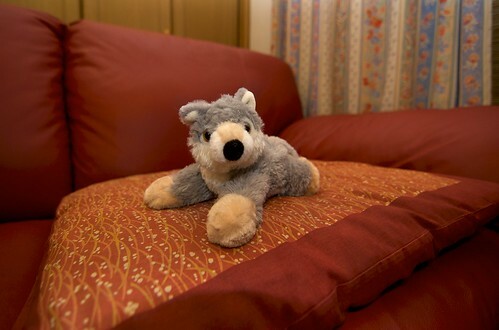 Wolfie (the wolf cub we smuggled out of Yellowstone in James' hat ) guards the new Ikea sofa. The sofa, even though it is Ikea's smallest 2-seater, was a breach delivery (over the balcony, into the 2F though the window). There is a difficult manly thing for men - when should a man help out the delivery men without diminishing the manliness of the manly delivery men. The answer? At the point when you realise the delivery men are heading over the balcony faster than the sofa is coming up. Japanese delivery men are small and dexterous. They never break or scratch anything. But this means they do lack mass... James with his huge grappling hook arms was able to save the day, and no one's manliness seemed diminished by the experience. Wakamiyaooji, Kamakura, originally uploaded by julesberry2001. Just another typical day on the high street in Kamakura. 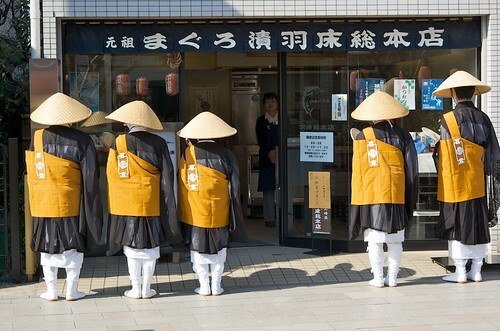 Still, probably better pilgrims than yakuza methodically shaking down the shop proprietors? I noticed that William the Weasel has had ten comments on his blog. He really shouldn't worry about it so much. Ten comments is infinitely more than jules' pics has received, and adding another one or two to his tally isn't going to change that. I see that through the Climate Onion (did they really aim to be a parody of climate science blogs, and in that case which ones are they parodying, I wonder rhetorically), Gabi Hegerl has offered a bet on future warming. The terms are simple: she is prepared to wager that at least one of the next 8 years 2010-2017 inclusive will be hotter than 1998 according to HadCRUTv. The stakes are a $10 bottle of wine, and she'll take on up to 10 opponents, for a whopping $100 max stake. Hans von Storch regards this as a "highlight" of his blog. It seems small beer to me, the stakes are smaller than the similar £100 bet I have with David Whitehouse (though I only win if one of 2010 or 2011 is hotter than 1998). Of course the $10,000 bet with Bashkirtsev and Mashnich is more interesting by a couple of orders of magnitude :-) Of course Hegerl is virtually certain to win, but the stakes are small enough that a couple of people so far have offered to take her up. 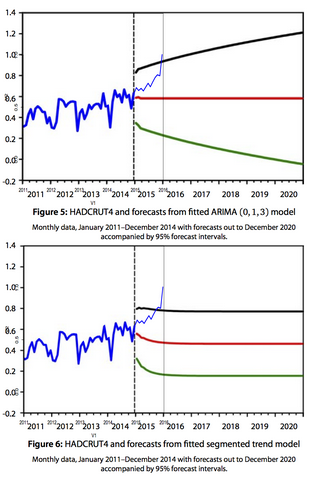 I see that Brian Schmidt has posted recently on the climate bets (thanks Hank for the comment). As he observes, I'm already well on the way to winning the big-money version with the recent 6-y rolling average comfortably above the 1998-2003 baseline (though we are not yet into the period that actually counts). Actually according to the NCDC data that we agreed to use, it's not quite as solid a warming as the figures he states, but never mind. According to January satellite data, things are looking promising for 2010 too, but it's early days yet, and El Nino seems to be about at its peak, so its contribution to global temperature may not last much past the summer (even accounting for a few months of lag). The surface obs generally lag behind the satellite analyses, HadCru still hasn't done last October's figures, but GISS and NCDC are up to date to the end of last year, and according to them it's about as hot as the end of 1997 was, without such a large El-Nino-attributable contribution. 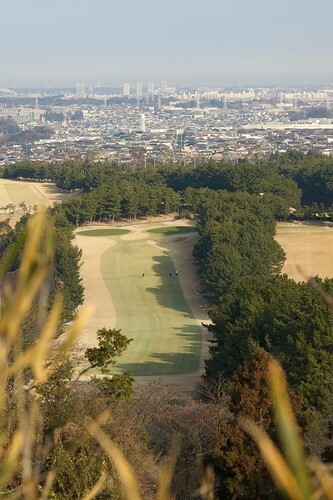 Golf course from Tenen Hiking course, Kamakura, originally uploaded by julesberry2001. Japanese winters being very dry, the grass goes completely brown, so some effort must be being put in to keep the golf course this green. After a hard week in the city (that's Yokohama in the background), the business man must sometimes spend the weekend playing "business golf". From the little I know, this sounds like it is even worse than standard golf, as it is more like a ritual than a game; everyone is very polite and the people from the host company have to make sure they lose to their client. 1. Did you engage in, or participate in, directly or indirectly, any actions with the intent to suppress or falsify data? 2. Did you engage in, or participate in, directly or indirectly, any actions with the intent to delete, conceal or otherwise destroy emails, information and/or data, related to AR4, as suggested by Phil Jones? 3. Did you engage in, or participate in, directly or indirectly, any misuse of privileged or confidential information available to you in your capacity as an academic scholar? 4. Did you engage in, or participate in, directly or indirectly, any actions that seriously deviated from accepted practices within the academic community for proposing, conducting, or reporting research or other scholarly activities? 1-3 were answered emphatically in the negative, and with reference to the "deleted emails", it is worth noting that Mann actually produced a fat file of the emails that he was asked to delete. 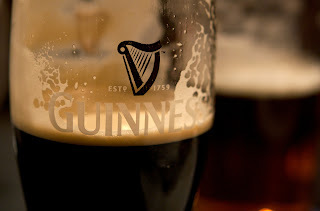 Not that it will stop the frothing. He must have deleted the one with Obama's Kenyan birth certificate! An investigatory committee of faculty members with impeccable credentials will consider this matter and present its findings and recommendations to Dr. Henry C. Foley within 120 days of being charged. Based on what has been dredged out of the emails, it seems to me that Mann actually comes over pretty well. Eg, contrary to the claims that he abused his position as IPCC author to promote his own research, he seems to have gone out of his way to ensure the presentation was widely supported. 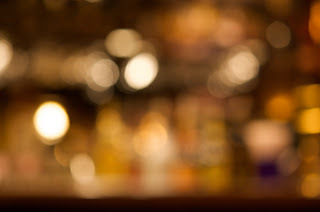 There are a handful of messages that other writers may not be especially proud of, so especially in the context of "seriously deviated from accepted practices" it has to be odds-on that the last allegation will be disposed with fairly easily. winter blossoms, originally uploaded by julesberry2001. 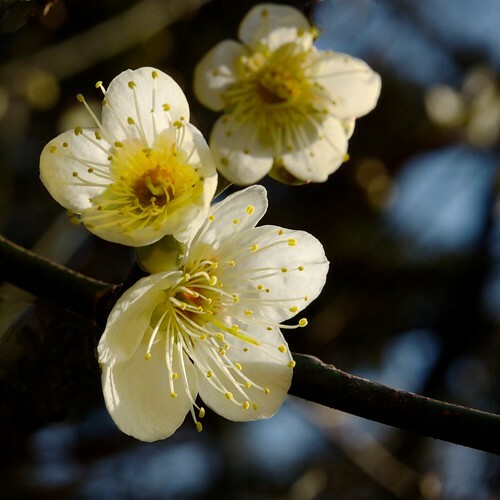 Identifying the trees when not in bloom: if you see a really old looking tree with broken bark and twisted branches, sometimes quite dark in colour, held together with string, that's probably ume. Cherry trees are typically more robust and youthful looking. Whether this is partly because the cherry are municipally planted by city workers, and replaced when they get fragile, rather than nurtured by loving gardeners for decades, I am not sure - but I think it is just the way the two trees grow. Japanese German Hotdog, originally uploaded by julesberry2001. More James food. 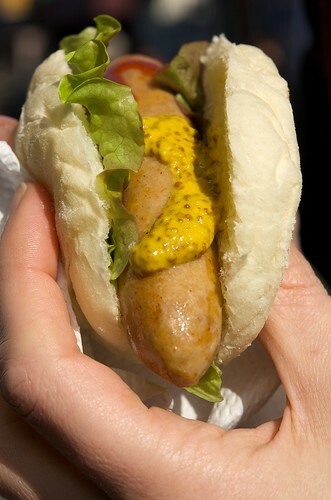 This basil sausage hotdog seemed like a good idea, after a hard morning's ume viewing. 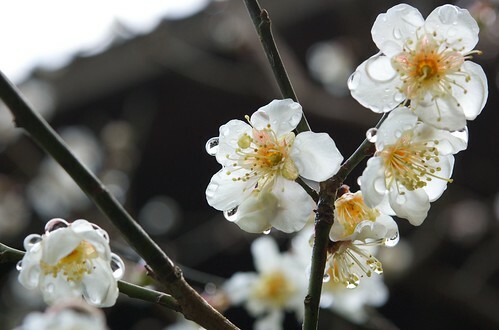 plum blossom 梅 うめ, originally uploaded by julesberry2001. The runner-up ume blossom on flickr was also taken at Tokeiji, in Kita-Kamakura, but for this one I used my 6.5 foot jointed and extendable bipod with internal stabilisation. These bipods are so cool - if you can get them positioned properly - sometimes it is almost like they have a mind of their own. An additional feature of the bipod is that, with the flick of a few meatballs, it can easily be adapted to carry flat pack furniture. simultaneous flowering, originally uploaded by julesberry2001. My habit is to remark on it being a good or bad year for a particular bloom, or leaf colour, or berry, and James' habit is to reply with cruel sarcasm to the effect that I couldn't possibly have any idea or even remember what last year was like let alone have any idea of the botanical long term mean state on which to base my judgement. So I was quite surprised when he asked me if I thought perhaps it was a good year for ume. Maybe it is the contrast with last year, which was quite poor for ume blossom, but the branches do seem thick with flowers. 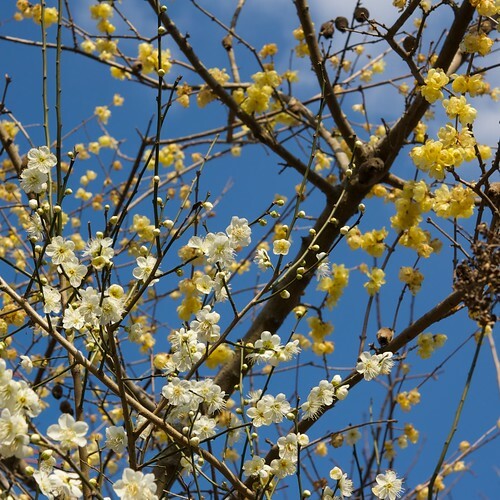 The white is plum blossom (ume, 梅, うめ) and the yellow the somewhat earlier flowering wax plum (robai). Photo taken in Kita-Kamakura.